By now, we’ve all heard plenty about the upcoming eclipse of the sun. On Monday, August 21, all of North America will be treated to an eclipse of the sun, and the rare event is creating quite a buzz, so much so that NASA developed a website to offer guidance and has issued a statement about its effect on GNSS users. Anyone within the path of totality can see one of nature’s most awe-inspiring sights — a total solar eclipse. This path, where the moon will completely cover the sun and the sun’s tenuous atmosphere — the corona — can be seen, will stretch from Salem, Oregon to Charleston, South Carolina. Observers outside this path will still see a partial solar eclipse where the moon covers part of the sun’s disk, NASA states. See the NASA map of the United States (above) showing the path of totality for the total solar eclipse. The extraordinary occurrence has created so much attention that NASA created the website specifically for this event. Here you will find activities, events, broadcasts, and resources from NASA and its partners across the nation. Information on where, when and how you can best view the total solar eclipse can be found on the website. This celestial event provides NASA a unique opportunity to study the sun, Earth, moon and their interaction because of the eclipse’s long path over land and coast to coast. It also inspired several NASA experts to work together on the statement to share with government agencies, the media, and the general public. Via live streams and a television broadcast, NASA will bring the Aug. 21 eclipse live to viewers everywhere in the world. The last time the contiguous U.S. saw a total eclipse was in 1979. From ionospheric point of view, the expected effect of solar eclipse is a significant reduction in solar EUV ionization (solar EUV radiation is blocked) and thus in the amount of ionospheric total electron content (TEC) with respect to nominal conditions along the eclipse path. Some observations also show wave-like TEC perturbations in small magnitude (~1 TECU) during eclipse as shown in the attached reference. The wave-like perturbations appear to be the effect of atmospheric gravity waves or traveling ionospheric disturbances (TIDs) that might be triggered during eclipse. I have not seen any reports about ionospheric scintillation observations during eclipse (I might have missed them). It would be interesting to analyze GPS data along the path of the upcoming August eclipse to see if any scintillation events could be triggered. 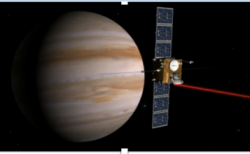 We have some GPS data processing tools at JPL and can contribute to this analysis. A solar eclipse occurs when the Moon passes between the Sun and the Earth, thereby totally or partly obscuring the image of the sun for a viewer on Earth. There is a region of Earth’s upper atmosphere, called the ionosphere which affects radio waves, including GNNS. The ionosphere consists of “ions,” a shell of electrons and electrically charged atoms and molecules. Because ions are created through sunlight interacting with the atoms and molecules in the very thin upper atmosphere, the density (thickness and consistency) of the ionosphere varies from day to night. Since GNSS is a radio signal, its measurements are slightly impacted by ionosphere changes, resulting in small increases in position error. For all except very precise GNSS users, these changes are negligible. Note that a total eclipse of the sun is similar to our day-night cycle, only very much faster. So, while the ionosphere will be more dynamic during an eclipse, it will not cause a loss of the GNSS signal. In summary, while any effects from the eclipse are of scientific interest, GNSS service should not be adversely affected by the Aug. 21 Solar Eclipse. 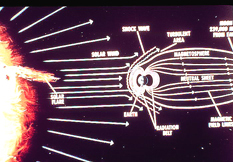 Ionospheric effects should not be confused with those from solar flares (a brief eruption of intense high-energy radiation from the sun’s surface) that can cause significant electromagnetic disturbances on the earth, impacting radio frequency communications/transmissions (including GNSS signals) and power line transmissions. Solar flares are not produced because of an eclipse. In issuing the statement, NASA acknowledged the expertise of Dr. Larry Young and Dr. Xiaoqing Pi of NASA’s Jet Propulsion Laboratory for providing the content, and Dr. AJ Oria of Overlook Systems Technologies for the coordination/editing.